The Combi Standard C3 26-35kW is a non-condensing, floor-standing oil boiler designed and manufactured by Mistral. It comes in a high-quality white casing and thanks to its compact size is able to fit underneath a work surface, saving you some valuable space in the home. This is a highly efficient unit, which you can see by its 93% efficiency rating, making the the C3 an A rated unit. With an output rating of 35kW, this unit is powerful enough to suit larger homes with multiple bathrooms that have a higher demand for heating and hot water. 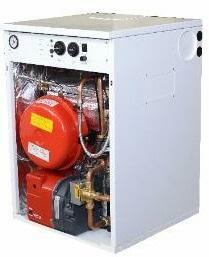 It’s said that this unit is able to produce twice as much as any other Combi boiler. There’s no shortage of choice with the Mistral C3 range as there are outdoor or indoor models, condensing or non-condensing units and a wide range of different outputs. Housed within the boiler is a variety of features, including front servicing access, high-quality casing, multi-directional flue outlet, conventional or balanced flue option, pre-punched pipe access points, as well as it being able to be used in tandem operations. This unit can also be built with the same Y section waterway heat exchanger as a condensing boiler. As this is a Combi boiler, it’s the ideal choice for homes where space is limited. This is because they don’t require any external water tanks or cylinders, with everything being wrapped up into one cost-effective unit. Featuring a 5 year warranty, you’ll be well covered by Mistral long after the installation.